You Are Here: Home » Blog » fire trucks » How many wheels does a fire truck have? How many wheels does a fire truck have? How many wheels does a fire truck have? Before answering that question it’s important to explore the history of the fire truck. Unbeknownst to many, the fire truck actually predates the automobile. It seems a little strange, but it’s true, the first fire engines were used as early as the 16th century. The first engines were used in Germany and were really nothing more than water pump on wheels, not unlike a portable water well. In 1721, an English inventor by the name of Richard Newsham patented the first American fire engine though it wouldn’t make it way to America until 1731. The early fire engines of the 18th and 19th century were like the one designed by Newsham had 4 wheels and looked more like a stagecoach had wooden wheels and were pulled by hand. It wasn’t until 1905 when the first modern motorized fire engines, which were designed by Knox automobile, appeared in America. Fire engines like the Knox 1905, which were built around normal truck frames, started off with four wheels but today the average fire truck can have as many as eight wheels. So then, how many wheels does a fire truck have? Depending on the country and the fire truck chassis it’s not uncommon to see a fire truck with 4, 6, or 8 wheels. There are over 50 fire engine manufactures operating in the United States alone, producing an equally as varied amount of fire engine chassises. One of the most popular fire trucks in use today is the Marauder II, a four wheeled fire truck manufactured by Seagrave Fire Apparatus, one of the oldest continuous makers of fire engines in the United States. Most American fire trucks have four truck wheels like the Marauder unless they are outfitted with specialized equipment like an an ariel ladder or tower in which case they will often have six tires. Most American fire trucks are equipped with standard commercial truck tries from Goodyear or Bridgestone like the common Goodyear G124 commercial tire. Goodyear tires, in fact, are very popular among many commercial and service vehicles like ambulances and fire trucks. While the tires themselves are pretty ordinary, several fire trucks have a useful and unusual tire accessory- automatic tire chains. Automatic tire chains are a small device that is installed onto a vehicle’s rear suspension and are powered by a vehicle’s air compressor (used to power the air brakes) which can automatically deploy chains under a vehicle’s tires to improve traction in snowy and icy conditions. 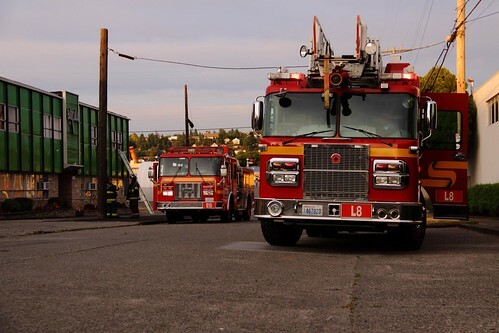 Automatic air chains are a necessity on fire trucks as they can be quickly deployed in hazardous conditions thus saving fire fighters valuable time that could otherwise be used to save lives.